Stir in flour and stir vigorously over low heat until mixture leaves the pan, forming a soft ball. Using a mixer, beat in eggs one at a time until all mixed in. Beat mixture until smooth and has elasticity. Drop by 1/4 cup or using a large cookie scoop onto ungreased cookie sheet or parchment paper. Bake 25-30 minutes, and make sure they are done and not under-baked. Poke or slit a small hole in each top of the cream puff to let the air escape. Beat milk and pudding mix with a whisk or mixer for 2 minutes. Gently fold in whipped cream. Let stand 5 minutes. Slice the cream puffs in half and fill with the chilled pudding mixture. In small sauce-pan or microwave bowl, add chocolate chips or chopped semisweet chocolate and heavy whipping cream and heat over low heat (or in the microwave) until the cream is very hot. Remove from the heat, and whisk together until the chocolate is melted and the icing is smooth. 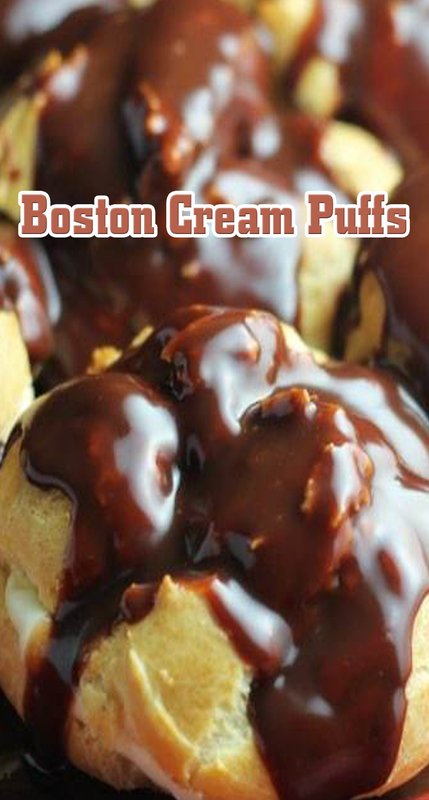 Pour a spoonful or two or three onto each cream puff. Serve immediately; or refrigerate for up to several hours.